Please refer to our stock # GG.J.2 when inquiring. Wood-fired Jar by George Gledhill; Payette, ID. H.9"(23cm) X Dia.11.25"(29cm) X Mouth Dia.5.875"(15cm.) 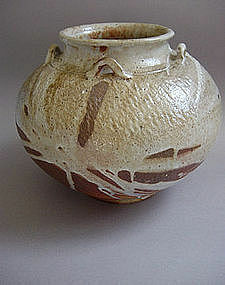 A lustrous Shino glaze covers the top half and one side of the pot, while the lower portion displays the effects of wood-firing. The lugs on the shoulders are inspired by Japanese "chatsubo" (tea leaf storage jars) of the 16th century. Please see the enlargements for multiples views, surface textures, and effects from wood-firing. There have been several influences to George Gledhill’s ceramic work. Buddhism has been a guiding force in life for many years, and George even visits local prisons to teach the Dharma to inmates. Through pottery and Buddhism, he was exposed to Tea practitioners who complimented his work and encouraged him to produce Tea wares. Their introduction to the world of Tea Ceremony has helped to shape much of his recent work. In the past, George served in the Peace Corps in Bolivia, working with local potters and using only materials available locally. They dug all of the clay, made the bricks, built the kilns, and formulated glazes from whatever materials they could find. The only firing fuel was wood. This experience led to a great respect for the results of working with unprocessed materials, and especially for the magical qualities of wood firing a “primitive” kiln. These pots were fired in an anagama kiln (built by George ten years ago) on George’s farm in Payette, Idaho a few years ago. They are primarily wood-fired, created using mainly raw materials available in the Pacific Northwest. The whole process is marked by a great deal of physical labor, but this is the only way to get the results he desires. Currently, George is on the West Coast taking a break from making pots to further his studies in Buddhism.